The recent mid-week rainy weather spells put an early end to the regular match season for the Cape Henlopen High School golf team. The Vikings were scheduled to play their last match of the year on May 11 against Woodbridge High School at Heritage Shores, the western Sussex County school’s home course. Cape’s head coach Claudio Smarrelli said he received a phone call postponing the match while the team was riding over to Bridgeville, but the rainy conditions during the trip kept it from being a total surprise. The schools re-scheduled the match for May 18. However, the inch or more of rain that fell on that day forced yet another call-off for the match. Smarrelli said that Heritage Shores staff said their course just couldn’t be made available in time to hold the match before the Henlopen conference tournament, now set for May 20 at Shawnee Country Club. Unfortunately, that means that Woodbridge and Cape simply won’t be playing each other this year. 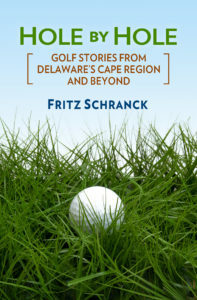 Unlike the regular nine-hole matches, the Henlopen conference championship is an 18-hole tournament, with tee times scheduled based on the seasonal average scores of the dozens of participants. The first tee times will start in the early morning, with the last golfer not expected to finish until the early afternoon. The only remaining competition for the Vikings after the conference tournament will be the upcoming state championship, to be held June 1-2 at Maple Dale Country Club in Dover. The Vikings finished in twelfth place among the sixteen qualifying teams in the last two years, and in seventh place in 2007. I am a member of the Golf Writers’ Association of America, and therefore receive the occasionally intriguing bits and pieces of mail from time to time. Recently a copy of the 2009 annual report of the Tiger Woods Foundation made its way into my post office box. The report was well worth perusing. The Foundation supports several different praiseworthy initiatives, and claims to have served 10 million youngsters since its inception. During the past year the Tiger Woods Learning Center provided educational programs for 5,000 elementary students in Orange County, California. In addition, the Earl Woods Scholarship program helped 25 students with their college educations through a mix of scholarships, mentors, and internships. The Foundation’s fundraising events, including the AT&T National and the Chevron World Challenge golf tournaments, supported programmatic grants to over 100 youth organizations. The events also raise needed cash that sustains the organization’s other charitable endeavors. I’ll bet they are, and I don’t think we have to guess at what he meant by “recent events,” either. For the sake of the kids who are the intended beneficiaries of the Foundation’s work, I certainly hope its founder can make his own way back into the good graces of his family and his fans. The charitable work that spins off from the professional golf tours, such as this foundation, are a great part of the nation’s private initiatives to help one another. It would be a shame to see this foundation falter because its founder can’t recover from his recent troubles. Pete Oakley, the Rookery’s Director of Golf, struggled during the Handa Senior Masters presented by The Stapleford Forum, held May 12-14 at Stapleford Park, in Melton Mowbray, England. He shot rounds of 77, 74, and 78 on the way to a tie for 66th place, earning 607 Euros for the three-day European Senior Tour event.